Senator Murkowski is well known for her passionate and uncompromising advocacy for Alaska’s veterans. A current member of the Veterans Affairs Appropriations Subcommittee, Senator Murkowski’s efforts have driven change in the Alaska VA Healthcare System by boosting access, increasing quality, and ensuring that VA appropriations keep pace with the cost of delivering healthcare. Senator Murkowski has also pressed for local and timely processing of veteran benefits claims at the Veterans Benefits Administration Alaska Regional Office. Since the beginning of the conflicts in Iraq and Afghanistan, demands on the Alaska VA Healthcare System have been steadily increasing. The return of veterans who served in the Middle East to nearly 100 rural Alaska communities required that the VA step up and improve service to Alaska veterans where they lived. The VA’s game-changing decision to partner with the Alaska Native Healthcare System to care for rural veterans was the direct outgrowth of Senate hearings Senate Murkowski conducted in November 2007, which exposed that the VA was unprepared to treat the service-connected issues of Iraq veterans returning to rural Alaska. And when the Alaska VA’s volunteer Tribal Veteran Representative program floundered because the VA claimed it lacked funds to send recruits to training, Senator Murkowski stepped in and showed VA a way to fund the travel. Today there are over a hundred volunteer Tribal Veteran Representatives serving Alaska’s veterans. At one time the Alaska VA had no hesitation about directing Alaska veterans to fly to VA facilities in the Lower 48 for care it could not provide and did not want to purchase from community providers. That came to a halt under scrutiny from Senator Murkowski. In April 2010, then VA Secretary Shinseki admitted to Murkowski, “We are going to look at very closely why we would send a veteran on a 2,000-mile journey if there is competent, safe healthcare available close by.” Shinseki ended the practice after a September 2010 VA Inspector General report, commissioned by Murkowski, demonstrated that hundreds of Alaska veterans were in fact being sent to the Lower 48 for care that could have been acquired from community providers in Alaska. Thus was born the “Care Closer to Home” program. These relationships enabled the Alaska VA to avoid the waiting list scandals that plagued Lower 48 VA facilities in 2014. When Alaska VA recognized that it was running a wait list it was poised to work with community care partners to seamlessly absorb the overflow. However, the Alaska VA healthcare system was not immune from the fallout of the Phoenix scandals. 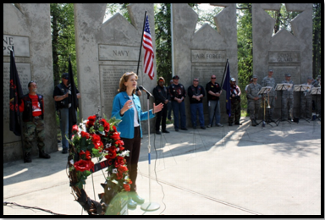 So-called “reforms” in the national VA healthcare delivery system have undermined Alaska’s success, causing Senator Murkowski to jump in once again and fight for Alaska’s veterans. In 2015, Senator Murkowski became aware of reports that the VA would pull out of the Joint Venture Hospital at JBER, sever its relationships with the Alaska Native healthcare system, and end “Care Closer to Home”—throwing Alaska veterans who couldn’t get their care at the Alaska VA into the new “Choice Card” program. In response to her efforts, the VA cancelled plans to withdraw from the Joint Venture Hospital and agreed to maintain its relations with the Alaska Native healthcare system. However, “Care Closer to Home” remains in jeopardy. Senator Murkowski, an early skeptic of the Choice Card program, emerged as one of its most persistent critics and remains so to this day. As a result of her efforts, the Senate Appropriations Committee report to accompany the Fiscal Year 2017 VA Appropriations bill notes that the Choice Act did not require the VA to abandon its successful community care program in Alaska and urges the VA to fully restore it. Senator Murkowski has also pressed the VA to improve its capability to deliver needed services in its own facilities. She has criticized the VA for failing to adequately staff the Wasilla Community Based Outpatient Clinic (CBOC) and has questioned the revolving door personnel problem at the Fairbanks CBOC. She has also questioned the VA’s decision to shutdown the operating rooms at the Anchorage clinic. She strongly supports the Vet Center program and has pressed the VA to make Vet Center services more readily available to rural veterans using telehealth technology. A strong believer in independent VA oversight, Senator Murkowski has commissioned numerous VA Inspector General reviews of the VA healthcare system, including a review of wait times, an assessment of staff vacancies, and chart reviews of veteran quality of care concerns. She has also commissioned a nationwide multiyear Government Accountability Office review of the Choice program. Murkowski is a proud co-sponsor of the Clay Hunt Suicide Prevention for American Veterans Act, which provides several measures to improve mental healthcare and suicide prevention resources to our military. The bill signed was signed into law in February 2015.